Did the likes of Voltaire and Goethe quaff at this former post house in Strasbourg? Some say so, and given the number of travellers who must have passed through its doors since the 1500’s it seems rather plausible. As one might expect, the building is situated right in the historic centre of the city and just a short stroll from the cathedral. 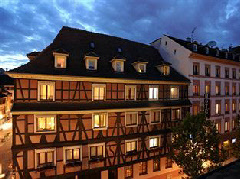 Timber-frame (as many of the old buildings in Strasbourg are), some of its guest rooms even boast the architectural detail of the structure, with exposed trusses and beams aplenty. The Hotel de l’Europe is three star rated and features 60 guest bedrooms in all. Dogs are welcome by arrangement.